Today is the first day if the Peaceful Warrior camp. We spend the morning by the pool and packing up and then it’s moving time again. We get a car to take us to our new home for the next week. We drive through an industrial area with lots of stone carvers, wood carvers, motorcycle repairs and the like. Nothing that pointed to any kind of resort. Dubious toward our information we suddenly were in the right street and found the place. Guillaume, who we accidentally bumped into in our hotel in Manila, was there with his family already and greeted us upon arrival. There where several known faces around like John from Japan, Emma and Mats from Sweden, and of course Claes, Lila and Fred. Our “room” was ready so we got to take our bags and move in. Right, “room”. We have our own villa with a large outdoor patio, big bedroom and an almost as large bathroom. Add to it that we got our own private pool and a day bed and you get the picture. Or maybe you don’t, so we put up some pictures. Inside the compound, down toward our gate. The places is just wonderful. We have been lucky enough to live some nights in fancy places on this tour, but this is the best yet. When I say private pool I mean private since we can close and lock the door to ensure privacy to our garden. We also found the bathtub filled with water and floating with rose petals. Sweet. We got served lunch at one o’clock and more and more people arrrive at the resort. There are some other Norwegians here as well, from our friends Richie’s club in Kristiansand. One if these fine gentlemen brought me a few packs of Freia Melkesjokolade (Norwegian milk chocolate), a treat unlike any other. Thanks to Richie for organizing and top Ralph for bringing it over. To bad Richie himself could not join us, it would be nice to meet up with him again. Training started around two and three different instructors have some twenty minutes classes. This made for an entertaining afternoon with Lila, Fred, Claes, Guillaume, James and Stefan giving us each something to work with. From double stick to Silat, internal martial arts in Qi Gong, to take down and locks via some empty hand to knife. As I said, an interesting afternoon. Suddenly the days training was over and we retreated to our villa and gather what’s needed for some pool time. In addition to the private pool’s for every villa, there’s a pool in the common area as well. We floated around there for a while before getting ready for dinner. Dinner was nice and we enjoyed both vegetarian dishes as well as chicken and fish. Both lunch and dinner has been excellent and I hope this will be representative for the week. And then we were suprised by a couple of dancers doing a traditional Balinese dance. After dessert was finished we had the weeks first Personal Development talk. 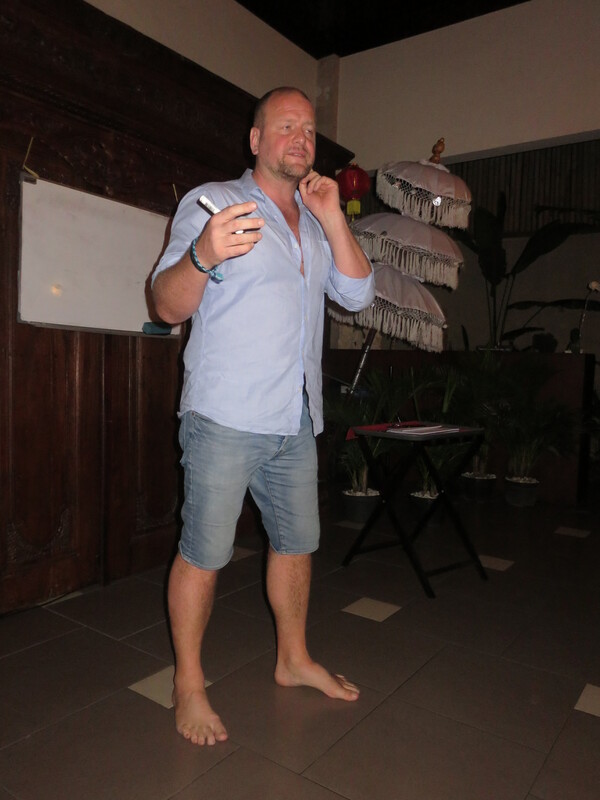 Claes was the first to run his and we covered presentation of each participant, causes and values of meditation and keeping a mind free off judgemental thoughts. I will say that I don’t think I do Claes justice by putting it all together like that, but you should rather be here on the camp and hear if for yourself. I think all retreated to their villas afterward to spend the last waking hours there before each did their lights out. 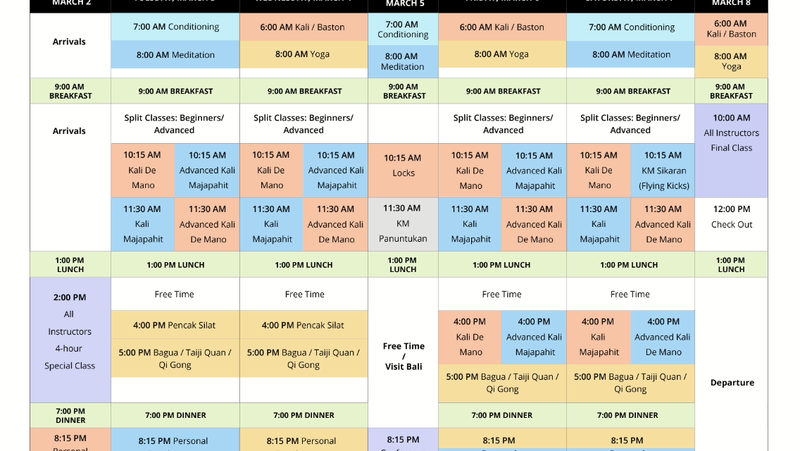 Tomorrow we start at seven with an hour of conditioning before we do an hour of meditation before breakfast. Another day in paradise is over. Thank you for sharing this Arne and Katja. Mark and I did not do a very good job of recapturing this experience on film and writing. This is a super reminder of our joint experience!